INCLUDES A PAIR OF PEDAL BOOTIES TO PREVENT WEAR WITH EVERY BIKE JACKET! We deliver to the continental United States and Canada or for pickup in Dresser, WI. If you are from Canada, please contact us to order. Safety Tips: Because Bike Jackets will create wind resistance while traveling on your vehicle, some racks may need an extra security strap. Know your rack. Jackets can be scrubbed with soap and hosed off. Please do not put them in a washing machine or dryer. 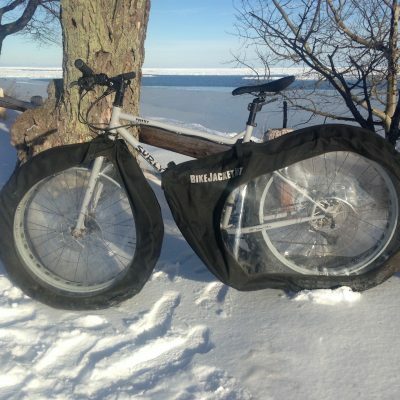 Never store your bike inside Bike Jacket if any moisture is present. 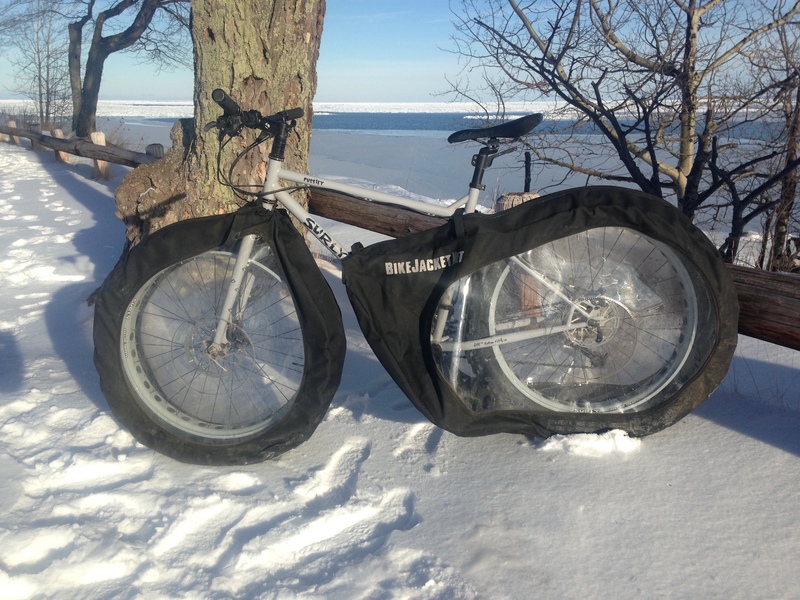 Store Bike Jackets flat or rolled-never folded. Avoid transporting bikes too tightly as it may cause rub spots in the jacket.Use enclosed “peddle booties” over peddles if they have sharp edges. 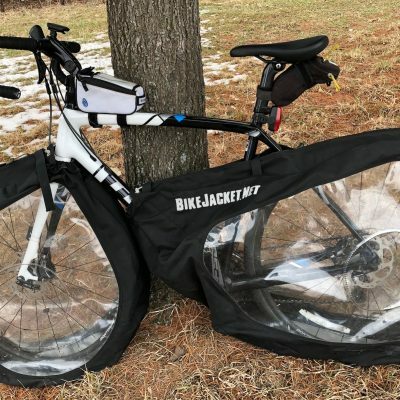 If you have a bike rack that utilizes a rear tire strap, be sure to cut the openings on a cutting board so as to not damage other areas of the cover. The fabric is rip-stop. There are three options so you can decide what’s best for your rack. Protecting the drivetrain is key when using the Bike Jacket, it completely covers the wheel, cassette and front chainring from any road grime and salt. Bike wheels and components are expensive and a Bike Jacket is a great way to protect your investment. Not only is it good for Winter but will also get plenty of use during the transitional periods during the Fall and Spring when the roads can get a bit messy. Love the jackets! On our first road trip today! Awesome, awesome-the jackets kept so much off my bike! Size large fits my Beargrease with 26 x 4.5 tires. Finding a way to wash my bike when the temps are below freezing was always a challenge. The bike jacket serves it’s purpose and the clear windows allow the brake lights to be seen. After investing in a carbon wheel set, I’m at ease knowing they are protected from salt and grime. Shipment to Canada was quick and seamless. It is truly all it’s advertised to be.